A Saturday night ( 21st Nov 2009 ) and it was only Jim and Dougie in attendance for this little tasting of a Glenfiddich Whisky – 12 Year Old Single Malt Caoran Reserve. Around Dougies table in his games room we sat and opened this grand wee dram. Set in the heart of the Highlands, Glenfiddich (meaning ‘Valley of the Deer’ in Gaelic) is a place of breathtaking beauty. The vibrant colours of an artist’s palate fill the surrounding hills and forests, while haunting castle ruins and a bubbling natural spring add to the romance. Glenfiddich is little changed since 1886, when William Grant and his nine children rolled up their sleeves to build the Distillery with their bare hands. These same silent warehouses and steamy mash rooms produce the world’s favourite single malt Scotch Whisky today. We would recommend all to visit Glenfiddich’s website as it is a nice and informative one, including a visit to their shop. Glenfiddich Speyside Single Malt Scotch Whisky Aged 12 Years Caoran Reserve. The name “Caoran” comes from the Gaelic for “peat ember”, reflecting the special character of this single malt. Its inspiration comes from times past and the pioneering ways of the Glenfiddich malt men who, in the days of coal shortages, used greater amounts of peat to dry the malted barley. The resulting earthy smokiness perfectly complements the fruit notes so characteristic of Glenfiddich Single Malt Scotch Whisky. Taste…Well rounded, creamy/oily, smooth yet dry and a spice with cherry sweetness. Finish…Long, dry with a hint of peat and smoke and a mellow sweetness. Nose…Sweetness comes in first followed by a dryness and a little smoke from a small peat campfire. Taste…Ultra smooth and clean plus a little spicy wood, oh so sweet, and vanilla putting its creamy nose in. Finish…A long and lingering finish, creamy and sweet showing off a touch of Islay smoke, leaving a warming glow and a happy Whisky Boy. Well that was a delight, sometimes you must go to the more popular Malts and not just taste the oddball bottlings and expressions, as this wee dram was indeed a grand wee dram. Jim and Dougie have 2/3 other expressions from the house of Glenfiddich and we are sure they will not stay to long in our Whisky cupboards. For all you drammers out there this range of malts is quite easy to obtain from you local supermarket, certainly a few of the core range. 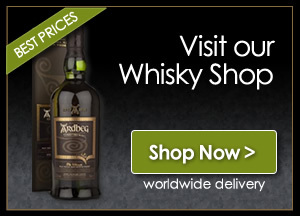 But you might have to go to a specialist dealer or indeed to the Glenfiddich website shop to obtain some of the rarer malts this great Distillery has to offer. Remember to tell them the Whisky Boys sent you. 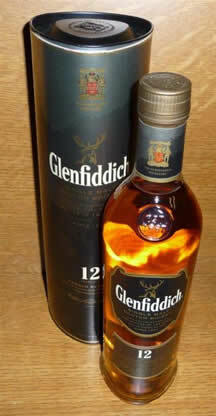 I have a bottle of Glenfiddich Coaran Reserve 12 year old single malt – it is a silver tin and has a silver label. Completely untouched, i’ve had it about 7/8 years myslef and am looking to sell it – I believe the Glenfiddich Distillery no longer produce this whisky and i’ve seen them advertised between £110 – £140 when they are available. How would I go about selling it – ebay seems such a waste, as it wont go to someone who will appreciate it. I personally prefer Cragganmore which i why i am looking to seel. Hi, thanks for your question regarding your bottle of Glenfiddich. As Glenfiddich is the worlds best selling malt, a bottle no longer available to buy at the distillery still means there will be 1,000’s available to buy online and at auction. If you were to sell this bottle at auction, ie. Mulbery Bank Whisky Auctions in Glasgow, I would estimate you would achieve approx £35 – £45. It is a great whisky buy unfortunately not worth much more than what you paid for it.